With the catalogue number, the actual orbital parameters – the so-called Two Line Elements – can be retrieved from the SpaceTrack website. 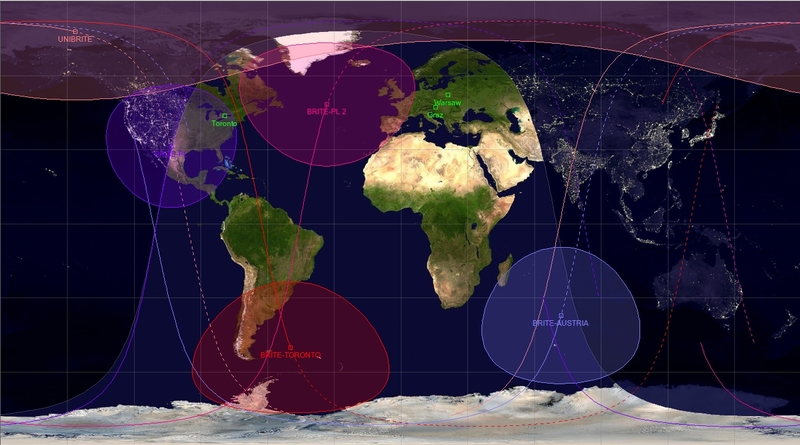 These can be used by any satellite tracking software to show the current position of a BRITE-Constellation spacecraft. The picture below shows the satellite positions with the Tracker software (Sumus Technology Limited, Copyright 2005-2013) at the given date of 17.02.2016 at 13:45:10 UTC. Any field on the sky can be observed with the BRITE instruments. There are no restrictions concerning the direction of the observation except that the bore sight of the instrument should not be closer than 90 degrees from the Sun. In general, fields will be observable with BRITE up to 180 days continuously (for at least 15 min during each orbit). When a given field can be observed depends in general only on it’s right ascension. However, there are small areas at the celestial poles, which can be monitored essentially all year independent of seasonal restrictions. ndia. Both satellites are were developed in collaboration with the Space Flight Lab (SFL) at the University of Toronto Institute of Aerospace Studies (UTIAS), the Institute of Communication Networks and Satellite Communications (IKS) at the Technical University of Graz (TUG), and Institute for Astronomy of the University of Vienna. BRITE-AUSTRIA and UniBRITE are the first two satellites launched and operated autonomously by Austria. BRITE-AUSTRIA, also named TUG-SAT-1, is funded by the Austrian Research Promotion Agency (FFG) and UniBRITE by the University of Vienna. Logo BRITE PolandPoland decided to join the BRITE-Constellation mission by contributing two satellites on December 16, 2009, when the (Polish) Minister of Science and Higher Education signed a contract to fund the project “BRITE: First Polish Scientific Satell ite”. The Polish Consortium supporting BRITE-Constellation was established in October 2009 by the Space Research Centre of the Polish Academy of Sciences and the Nicolaus Copernicus Astronomical Centre of the Polish Academy of Sciences. The first BRITE satellite, BRITE-Lem, was launched on November 21, 2013, from Yasni, Russia, while the second satellite, BRITE-Heweliusz, followed on August 19, 2014, with a Chinese launcher. In December 2010, a contract was signed between the Canadian Space Agency (CSA) and the Space Flight Lab (UTIAS-SFL) of the University of Toronto, Institute for Aerospace Studies (UTIAS), to add two satellites to BRITE-Constellation. BRITE-Toronto and BRITE-Montreal were launched together on June 19, 2014, from Yasni in Russia. Unfortunately BRITE-Montreal did not separate properly from the upper stage of the rocket, and therefore is not operational.